Many people were surprised when Muhammad Yunus and his Grameen Bank won the 2006 Nobel Peace Prize. Those of us who knew his work loved it, but for some of my friends and colleagues, the link between microcredit and peacebuilding (or for that matter, comparative politics) was hard to see. In fact, a number of us were surprised by the fact that we had to explain why his selection made sense. With the publication of A World of Three Zeros, it is easy to see why Yunus deserved the award then and is even more deserving of our accolades today. First, the book is one of the first to situate a specific development agenda within the framework of theUN’s Sustainable Development Goals which could and should be reshaping the work of all of in peace and development arenas. 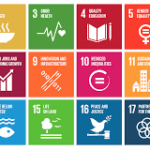 If nothing else, the SDGs show us how much of a wicked problem development is because the international community finally realizes that we can’t make progress on any of the seventeen goals unless and until we make progress on all of them–including peacebuilding. That’s important for comparative politics, too, because it helps scholars and students alike see the integrated nature of all the issues we associate with globalization and how they affect everyone, not just the poorer countries and people in the Global South. Second and more importantly, it’s hard not to be amazed .by the partnerships Yunus has been able to create and/or inspire. Microcredit was a fringe phenomenon when I first learned about it in the mid-1990s. Now, Yunus and his colleagues have built alliance with the likes of Danone foods and Crédit Agricole. In so doing, he is both critical of capitalism but creating a new version of it in which what he calls social business in which private corporations help solve public goods become the rule rather than the exception.